Wheelabrator Group is a global leader in surface preparation equipment. The company manufactures shot blast and shot peening equipment used by a variety of companies to provide finishing solutions. Flammer Relations had the privilege of working for USF Surface Preparation Group, US Filter and Wheelabrator Group for a decade providing public relations and content marketing for the various brands within the company. Our scope of work for this business to business company included announcing new products and services via press releases, trade show support, advertorials and case studies. 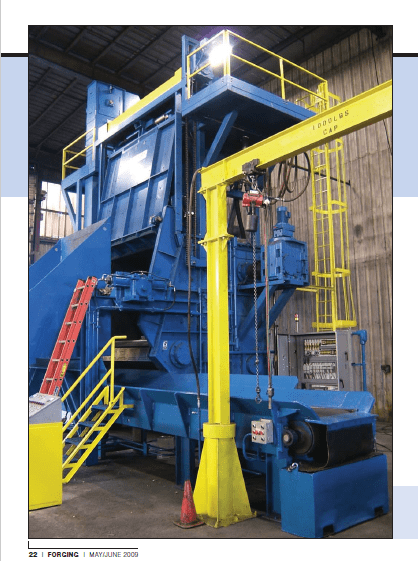 Wheelabrator manufactures a wide variety of equipment to solve shot blasting needs. 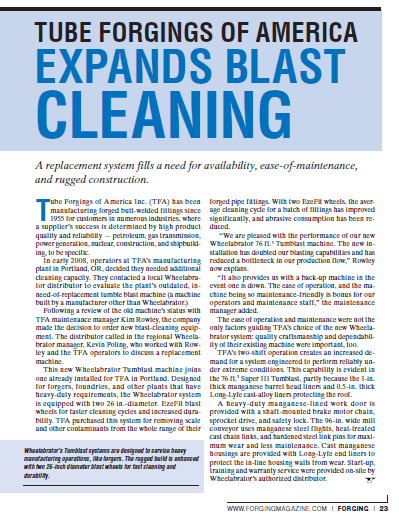 Press releases for Wheelabrator Group targeted trade publications with stories on new equipment and the solutions they provided. Publications that covered Wheelabrator and its products in their news included FM&T, Equipment Journal, Shot Peener, Coatings Pro, Fabricator, Thomas Net, Trailer Body Builders, Modern Casting, Wire Journal International, Metal Finishing, Heat Treatment Progress, Forging, Plant Engineering, Fox Business, Cloud Computing Journal, Pipeline and Gas Journal, PCI Paint & Coating, Forging, American Machinists and Manufacturing Talk – to name a few. Trade shows provide a wide variety of opportunities to connect the experts to the media. From scheduling media interviews in the show booth to coordinating full press conferences before the show floor opens to plant tours of the LaGrange facility, we’ve done it all for Wheelabrator. We produced press kits, scheduled press conferences and scored media coverage on new products for a wide variety of shows including Cast Expo, Eastec, Fabtech, IMTS, NADCA, Southtec and Westec. 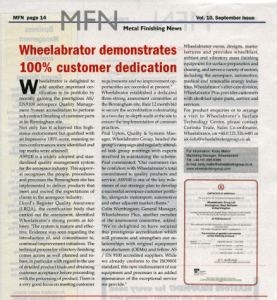 Client case studies demonstrate how Wheelabrator products solved problems for customers. The installation of a Wheelabrator® Preservation Line complemented the new Delta Steel facility opening in Morgan City, Louisiana. As a provider of components for oil rig platform applications and large sheets of steel for the shipbuilding industry, Delta Steel uses the Wheelabrator Preservation Line blast and paint systems. This is used for on plate and structural shapes for rust and scale removal and surface profiling. In addition, a weldable zinc-based primer coat of paint is applied for corrosion protection prior to storage or subsequent manufacturing operations. Steel surfaces are first dried, pre-heated, and then shot blasted and painted automatically before being dried in a hot-air tunnel. 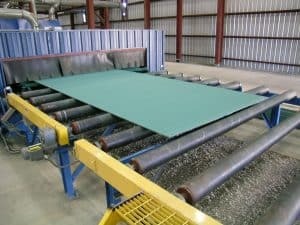 The Preservation Line allows Delta Steel to clean and paint stocked materials per each customer’s requirements while also distributing steel products to customers in a time-sensitive manner, often within hours of placing an order. The machine is designed to blast steel plates up to 160” wide, 2” thick and 60’ long. It can also blast and paint 42” I-beams, with process times typical between 5 to 10 FPM. . . . . .
We worked with Wheelabrator on its 100th Anniversary celebration. Media and dignitaries were invited to the facility in LaGrange, Georgia. In remembrance of the company’s 100-year celebration, Wheelabrator President and CEO Robert E. Joyce, Jr. presented Mayor Jeff Lukken and Congressman Lynn A. Westmoreland with specially commissioned Wheelabrator coins and a book, “Revolutions, The first 100 years of Wheelabrator Group.” The 100th Anniversary celebration was commemorated with a Japanese maple tree planting and the creation of a time capsule. The tree graces an outdoor courtyard at the corporate office, and will serve as a reminder of the company’s ongoing growth. The capsule will be unearthed in 50 years so that the future of Wheelabrator can reflect on the company’s past. When you are ready to take your business-to-business marketing to the next level, let the team at Denim Marketing know. We’d be happy to provide media relations, trade show press support, case studies and more.